Are cat cafes even quirky anymore? They’re so standard in Seoul now that I hardly ever bat an eyelash at ’em. Anyhoo, when we first moved to Korea, I was so excited by the thought of feline-filled cafes, but after my first visit to one in Busan I left with a wounded thumb and vowed NEVER AGAIN! (You can revisit my catastrophic experience here.) 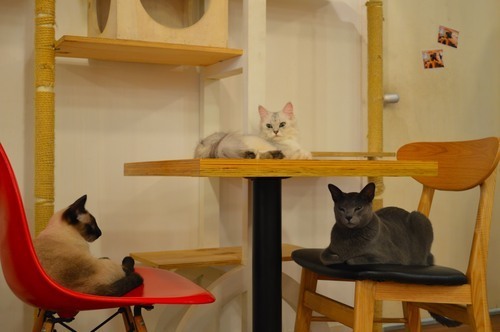 However, Table A cat cafe in Sinchon recently lured me into its cat-covered confines and totally changed my mind. I mean, could you resist this face?! Last weekend Eoin and I had our first cat cafe experience!